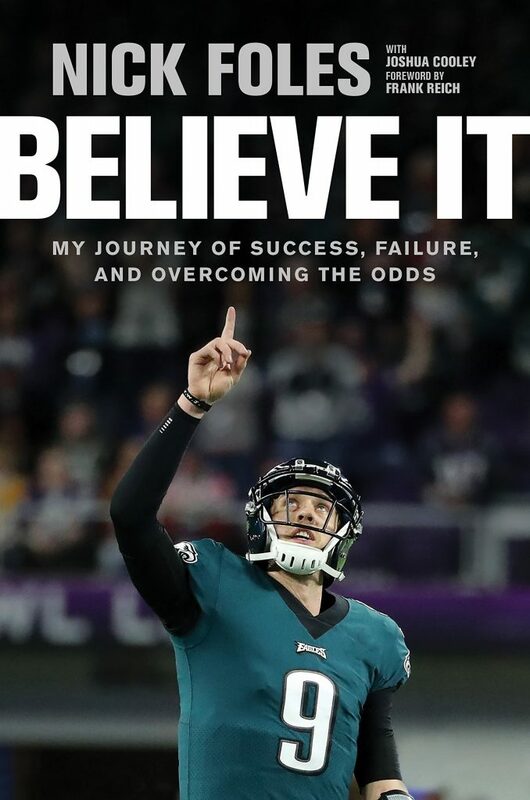 Nick Foles, Super Bowl champion QB, will be signing copies of “Believe It!” in various locations across the country next month. Nicholas Edward Foles (born January 20, 1989) is an American football quarterback for the Philadelphia Eagles of the National Football League (NFL). He played college football at Arizona and was drafted by the Eagles in the third round of the 2012 NFL Draft. He has also played for the St. Louis Rams and Kansas City Chiefs. Foles played his first game with the Eagles in Week 10 of the 2012 season after Michael Vick left with an injury. Foles then made his first start the following week. In Week 9 of the 2013 season, he became the second quarterback to post a perfect passer rating (158.3) while passing for more than 400 yards, and also the first quarterback in NFL history to post a perfect passer rating and throw seven touchdowns in a single game. It was the 60th time in NFL history that a perfect passer rating was achieved overall. Get ready to defy the odds when everyone’s counting you out. When the Philadelphia Eagles’ starting quarterback went down with a torn ACL in week 14 of the 2017 NFL season, many fans?and commentators?assumed the Eagles’ season was over. How did Nick get it done?winning MVP honors, silencing the critics, and shocking the world? How did the man who was on the verge of retiring just two seasons earlier stay optimistic and rally the team to an astounding win? How did he stay ready despite numerous trades and discouraging injuries, able to step up in the moment and perform at the top of his game? Believe It offers a behind-the-scenes look at Nick’s unlikely path to the Super Bowl, the obstacles that threatened to hold him back, his rediscovery of his love for the game, and the faith that grounded him through it all. Learn from the way Nick handled the trials and tribulations that made him into the man he is today?and discover a path to your own success.